Actually, I did not have an intention to blog this mini family trip but many friends have been asking for feedback and reviews on my experience with this cruise. 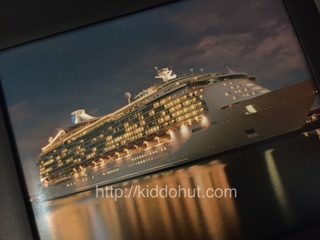 So, here it is, the review on the Cruise of Royal Caribbean: Mariner of the Seas! There were “to-be-paid for” and “paid-for” food on the ship. Basically, all your meals are provided for (free) and there are certain dishes in the menu that come with a price tag, those need to be paid. So, peel your eyes properly and ask if unsure. Main meals on deck 3, 4 and 5 (3-4-5) are better food compared to buffet on deck 11. Deck 11 are for people who just want to have a quick munch before heading for activities or people who could not wake up early enough to dine in 3-4-5 or people who doesn’t care the taste but go for varieties. Menu on 3-4-5 is a ala carte buffet. I love their Indian selection in particular and especially impressed by their sugar-free desserts because you simply couldn’t differentiate between the full-of-sugar and the free-of-sugar dessert. There is a theme breakfast which you need to reserve in advance before boarding. Apparently such breakfast with cartoon characters is pretty popular. We tried to make a reservation on the day of boarding, we were told that it was full. There is a formal dinner called captain dinner on the second night. Apart from some dancing from the cruise staff, I don’t think I see the captain any where. Alternatively, you can ask for meal to be delivered to you but you need to hang your selected menu on your room door before 3am. No fret if you are hungry in the middle of the night or middle of your swim, food is available (free, of course) most of the time. Just pop into the café on deck 5 for a midnight sandwich or cake and coffee or tea. Hot dog buns and ice cream are available on deck 12 – Sports deck. Age below 12 can still enjoy rock climbing, swimming and mini golf. In addition, the cruise staff will also organise activities that are appropriate to age group. Age below 3 may get a bit bored here as the cruise converts its bar to a mini play area for age 3 and below. There were some fisher price and little tikes toys scattered within the play mat. As a parent, if you still prefer to leave your kids to a childcare on a cruise holiday, you have the option by paying for couple of hours of care in the nursery room. One good sign was, the nursery room was always locked whenever I walked past which means no demand for this service. Any other age above 18, you can still enjoy the cruise if you love Jacuzzi, casino, or just lazing around. The ship has a threatre, karaoke lounge and ice skating ring. Apart from the karaoke lounge which you can entertain the rest of the passengers by singing on the stage, you are not allowed to go up to the stage of the threatre to perform nor showing off your ice skating skill in the ring. One recommendation, the finale show on the last night of cruise is a must watch! They have a daily bingo game at 3pm at the lounge, which I am not sure if that is a permanent activity in the schedule or just forthat cruise. But, I kinda enjoyed the bingo game although I didn’t win any. There are many activities which I didn’t manage to cover everything including the outdoor movie screening at various timing. The service staff was very polite and helpful especially those who cleaned our rooms. And, if you need them to make up the room any time, they were all ready to help as long as you are able to catch them as one staff serves 30 rooms I think. There are a couple of shops selling luxury watches on Deck 5 which were not to my likings so effectively I did not even step inside any of these shops. There was a bazaar for luxury handbags that go for 30-70% on the second night. Currency and internet – please be mindful that everything on the ship is paid in USD and there is a 18% tax. There is no free WiFi, you can purchase the plan at us$ 20 per day. Have fun and enjoy your cruise!